The International Spy Museum is your chance to fulfill a dream many of us have in childhood: namely, to be a spy. It's for those who love spies, spy gadgets, and spy movies (especially James Bond), as well as for those who love history and can appreciate stories of real-life undercover operatives and hair-raising adventures. BUT there are some things this museum is not-- namely cheap when it comes to admission-- or enough to keep little kids (and perhaps some teens) fully occupied... except under certain circumstances which I'll explain later. Because the admission fee is relatively hefty, particularly in a town like Washington, DC, were so many things are free, you'll want to read my full review before you decide whether a trip to the museum is right for you at this time, particularly if you have small kids. First, I'll discuss the museum highlights, then help you decide whether or not museum is right for you. You may want to start by watching the four-minute film below which gives you an overview of what you'll see at the International Spy Museum. When you arrive at the museum, you can enroll in their School for Spies. You'll be given an undercover as an agent and then watch a briefing film which explains what it's like to be a spy. As you move on through the museum, you'll see exhibits on spies from the battlefield to the ballroom (think Mata Hari), plus my personal favorite part of the entire museum: Exquisitely Evil: 50 years of Bond Villains. If you don't mind paying extra, you can enjoy two interactive spy experiences. The first one is called Operation Spy, a one-hour live-action spy adventure where you are the spy, and the second is called Spy in the City which lets you see Washington, DC, through the eyes of a spy by taking a GPS-guided tour of the city. Each experience takes about one hour. Both are only for individuals ages 12 and up. You can purchase them as part of a Museum Combo ticket (which gives you admission to the museum plus the interactive experience) for $28.95. Purchased by itself, each interactive mission is $14.95. So it is possible to visit the museum the first time, then come back for one of the missions alone on a different visit. Admission - Is it worth the price? Admission to the International spy Museum is $21.95 for adults ages 12 to 64, $15.95 for seniors, military, and law-enforcement, $14.95 for youth ages 7 to 11, and free for children ages 6 and under. Unless you spring for some of the specially priced missions, you may find that kids under age 10 won't appreciate the museum fully and will zoom through things that adults might enjoy lingering over for hours. So if you do have little ones, you may be better waiting until they are older and can easily read and enjoy detailed explanations of spy exploits before you fork out admission to the museum. 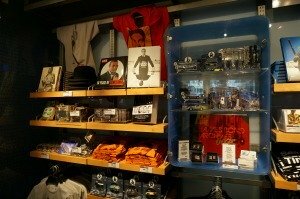 Having said that, even if you do you think your kids are too young to enjoy the museum now, I still recommend that you stop by the museum simply to browse their amazing gift store, which is absolutely packed with spy gadgets, books about spies, videos, and yes, life-size cutouts of James Bond. Museum hours vary by the time of year, but are generally 9 AM to 7 PM during spring and summer, and 10 AM to 6 PM the rest of the year. However, they can vary by date, so be sure to go to www.spymuseum.org to check the latest hours. The museum is closed Thanksgiving and Christmas. The gift shop at the museum is worth a visit by itself! The International Spy Museum does not have a dedicated parking garage. However, there are a number of parking garages nearby or, you may be able to get metered parking on the street, particularly if you visit on a Sunday when Washington DC tends to clear out. On Sundays you have the added benefit that metered street parking is free all day. 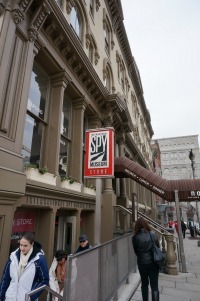 The International spy Museum is very close to Ford's Theatre, which in turn is only a few blocks away from the Newseum, both of which are completely worth a visit. 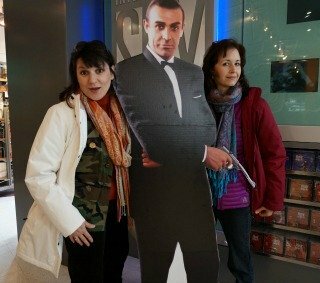 So the last time we were in Washington DC we stopped in the Spy Museum after visiting Ford's Theatre simply so we could browse the gift shop (and take the photo with the life-size Sean Connery cutout!). Want to do Washington DC for less? Check out my Free Washington DC page!